This page lists some popular science stories, videos and podcasts I have contributed to, and other general outreach activity. I have not always kept track! University of Sydney online story about active region 11029 by Alison Muir (Jan 2010). COSMOS online story about active region 11029 by Heather Catchpole (Feb 2010). Also, a Uni of Sydney online News story (December 2012) was written by Verity Leatherdale about the American Journal of Physics article (available from my publications page) I wrote with Rod Cross on the slinky. In February 2013 I recorded an Academic Minute for the US Northeast Public Radio, which aired in March 2013. The mp3 file from the story is archived here. I also have a page with more information on the slinky work. 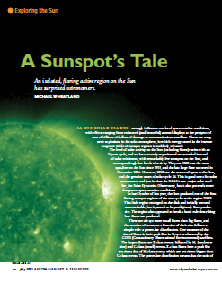 Article for Issues Magazine (a resource magazine for secondary school teachers) on the solar cycle and space weather, edited by Sally Woollett, which appeared in No. 106 (March 2014). Quote in story for online news outlet news.com.au (Feb 2010). Quote in story in online news outlet abc.net.au (Feb 2010). Podcast of interview with me by Mike Kermode for 2SER-FM's The Breakfast Daily (Mar 2011), on the topic of space weather. Quote in story in online news outlet dailytelegraph.com.au (Mar 2012). Uni of Sydney News story on the transit of Venus (Aug 2012). Radio interview on 2SER about the prospect of a new Maunder minimum and mini ice-age (July 2015). The mp3 is archived here. Producer: Lucy Ross. A Nova Science for Curious Minds Topic on Solar Storms, which I helped referee (July 2016). Content Producer: Mischa Andrews, Australian Academy of Science. Story about the Sun in ABC Online by Genelle Weule (August 2018). Live ABC News interview on the Parker Solar Probe (August 2018).